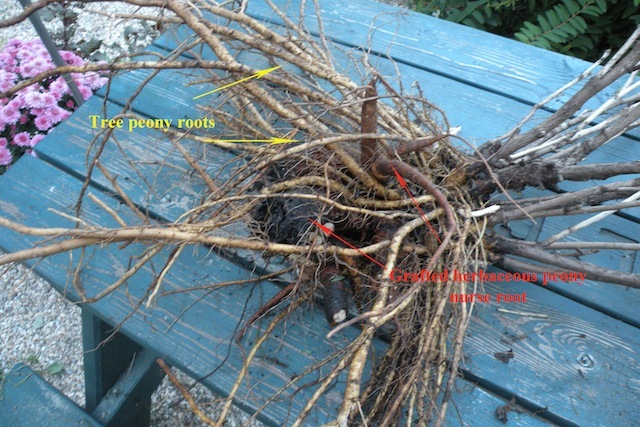 The principle method by which tree peonies are propagated is by grafting. This is a rather involved, labor intense procedure. 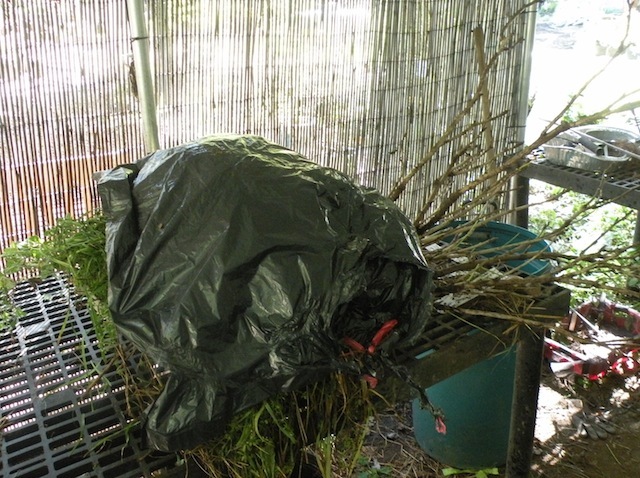 Much simpler is to propagate your favorite tree peony by means of division. The technique used for this is similar to that for dividing herbaceous peonies. Not all tree peonies are good candidates for division. Only those which are growing on their own roots will successfully divide. Tree peonies with only one or two main trunks should NOT be divided. 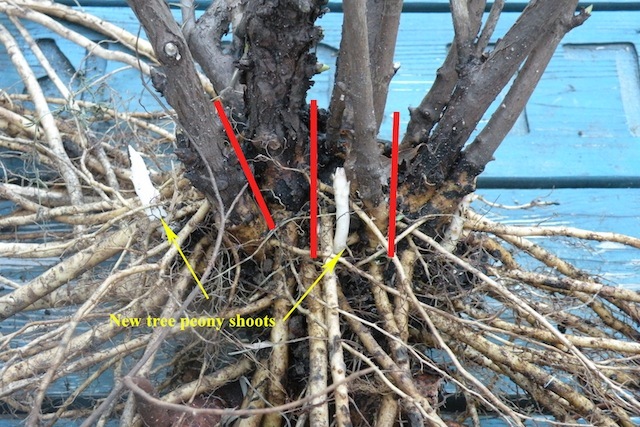 Most likely a tree peony with this kind of growth habit is not growing on it’s own roots and is still reliant on a large grafted herbaceous peony nurse root. Also, before deciding to attempt to divide a older, well established plant, remember that tree peonies are slow growing. It will take many years before divisions attain the grandeur of a mother plant a peak bloom. With that said, lets get chopping! First, choosing the right plant to divide. With only two main trunks, this tree peony would not make a good candidate for division. In this case it is even possible that the plant is not on its own roots and is still reliant on its grafted herbaceous understock. Attempting to divide a plant with this form my result in no viable divisions. A multi-stemmed tree peony is a good candidate for dividing. Notice many vigorous stems from the base. 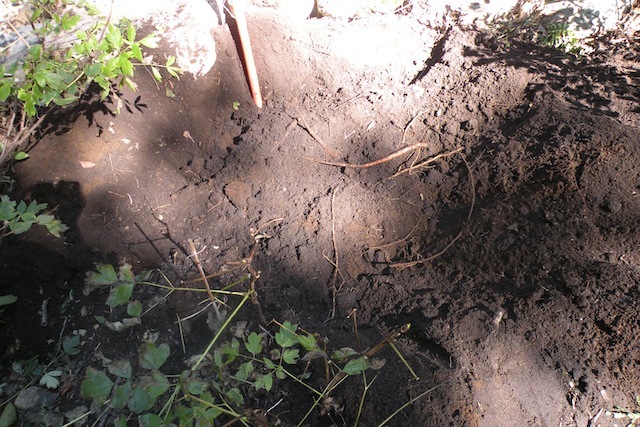 This is indicative of a spreading root structure. 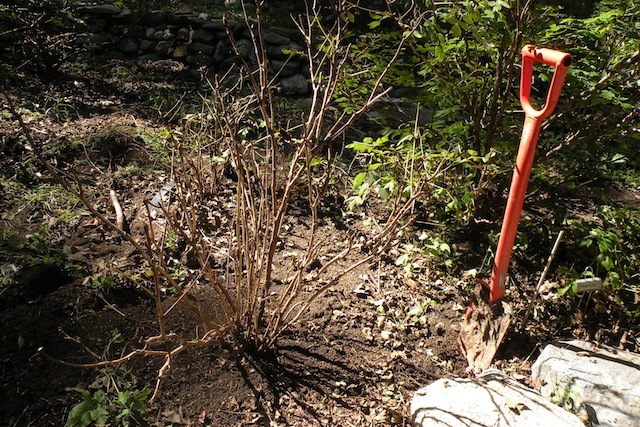 Before digging up a peony, remove the leaves. 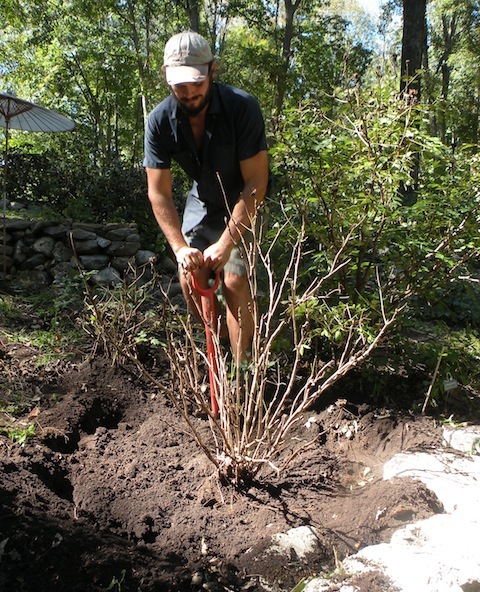 Begin by digging around the drip line of the plant. 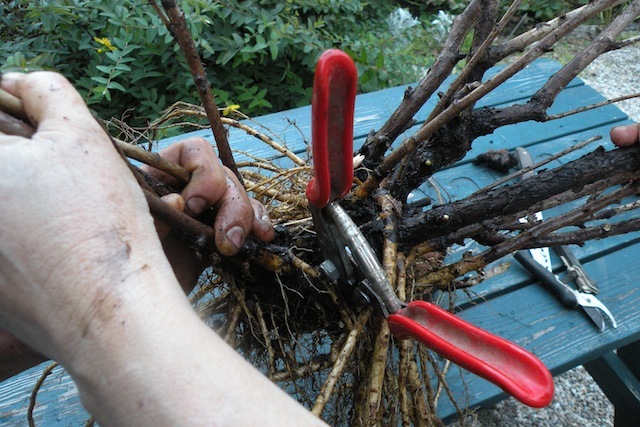 After loosening the soil a bit, remove some by hand from around the base. This will help to free the roots from the ground. Dig around the plant some more. Be patient, good divisions are dependent on undamaged roots. 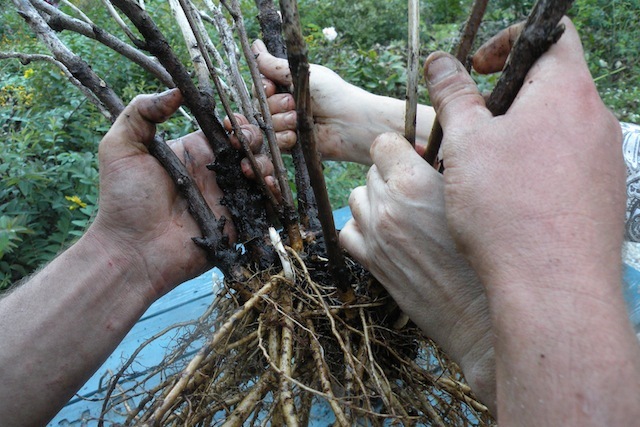 Roots are easily broken by hasty and careless digging. 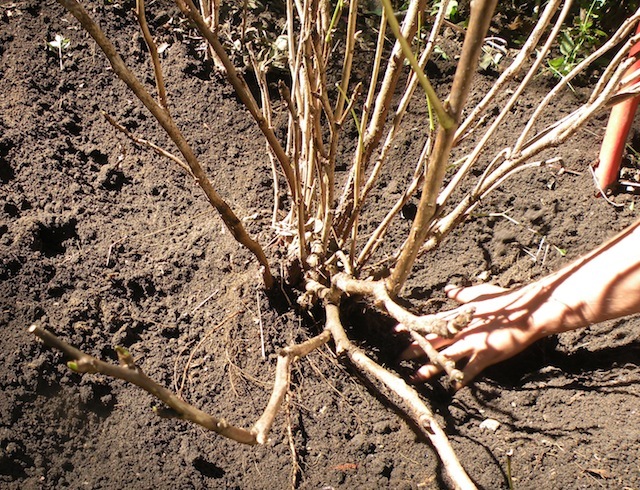 With enough soil removed, the plant should just ease out of the ground with a little gentle prying. Quite a crater is left from the excavation! The next step is to wash off the roots. roots are lighter in color as well as much longer. We like to allow the plant to ‘rest’ for a few hours. We wet the roots and cover them with damp burlap. This allows the roots to dry ever so slightly and results in them being less brittle and thus less prone to break during the division process. 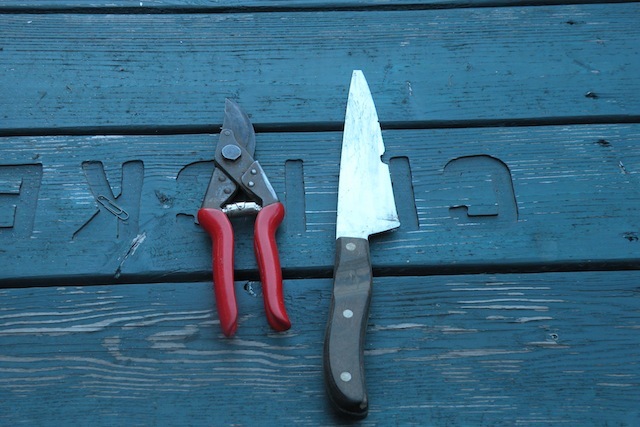 The two main tools you will need are a sturdy pair of garden snips and an large old kitchen knife. Be sure to wipe your tools down with isopropyl alcohol before beginning. This sterilization will prevent harmful bacteria and fungi from spreading via the cuts you will make. If the herbaceous nurse root is still present, remove it before beginning the actual divisions. 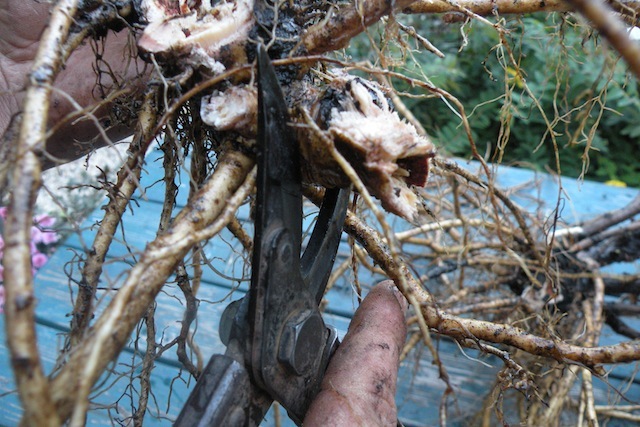 The herbaceous peony nurse roots should slice off relatively easily. 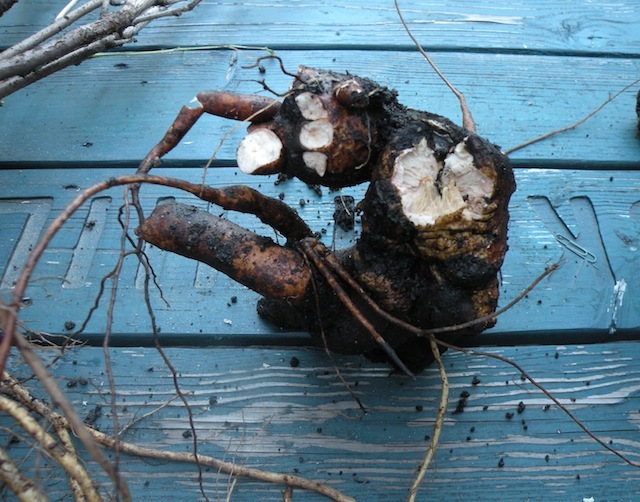 Once removed, the old herbaceous peony nurse root can be discarded. Or you might try replanting it. Its possible that small, heretofore dormant buds will begin to grow on it. If you do this, expect to wait a few years before you see a flower from your new herbaceous peony. Now you are ready start dividing. The first step is see where the plant looks like it might naturally divide. This allows you to visualize the cuts you will need to make. In order to be viable, a division must have both buds for above ground growth as well as adequate roots. 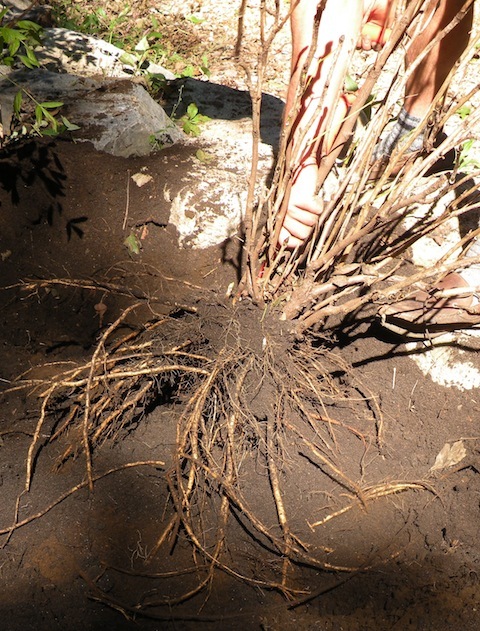 Look for naturally occurring divisions that seem to have both adequate stems and roots. Take special note of the new tree peony shoots coming up from the crown of the plant. Be careful not to damage these. Its often best to initially try prying the plant in half. You may need to call a helper at this point. 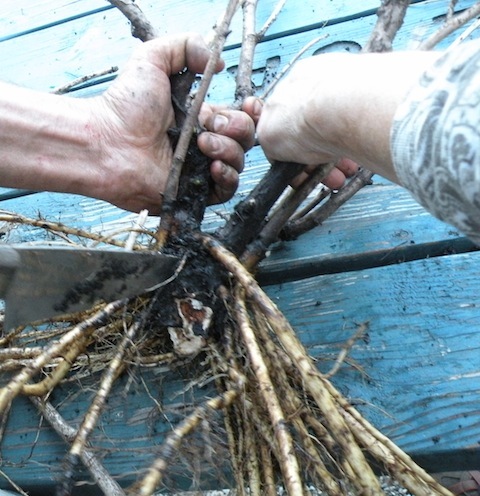 A well placed snip will break through a shared piece of root. 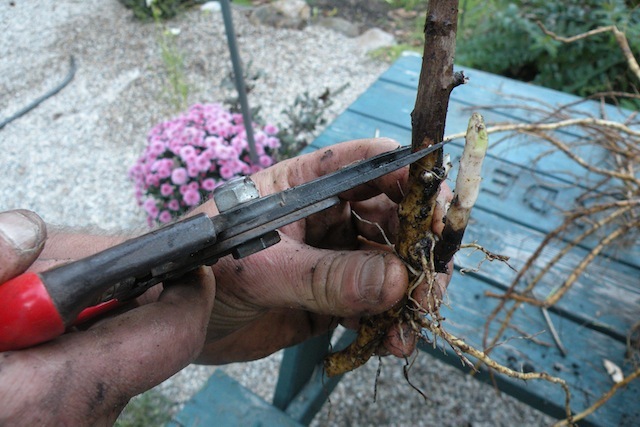 The roots are very intertwined, so be careful and pull divisions apart gently. One of the resulting divisions. It has a good stem to root ratio. You may want to stop at simply splitting the plant in half, or you might opt to maximally divide your plant. 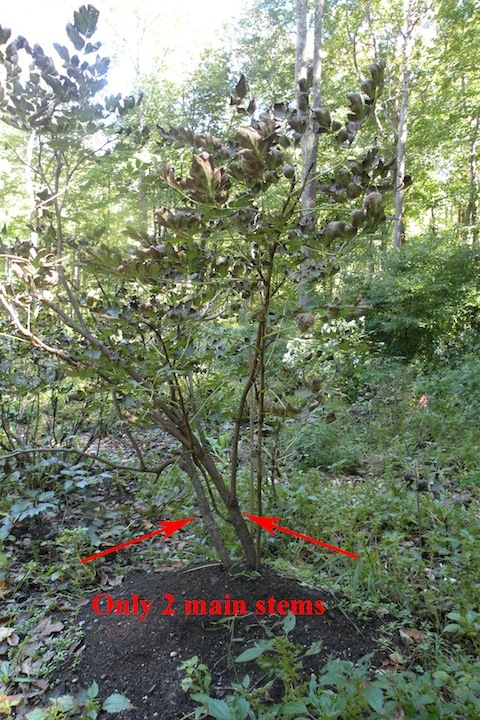 We have chosen to maximize the division of this rockii tree peony. 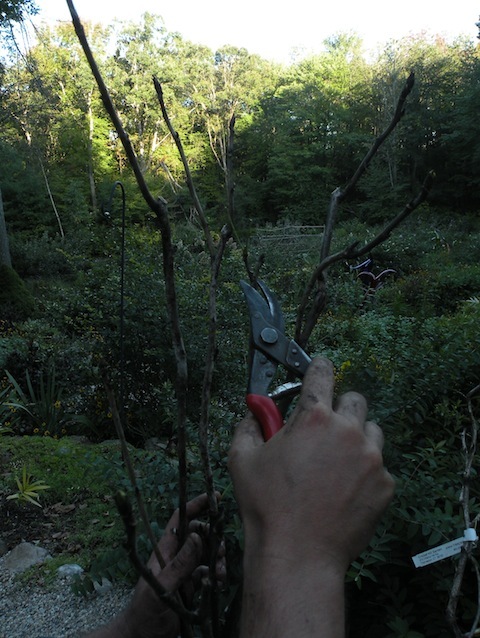 Further division beyond a simple split will probably require cutting through the hard, woody crown of the plant. Keep your helper around to help with this as well. When you are satisfied with your divisions, clean them up. 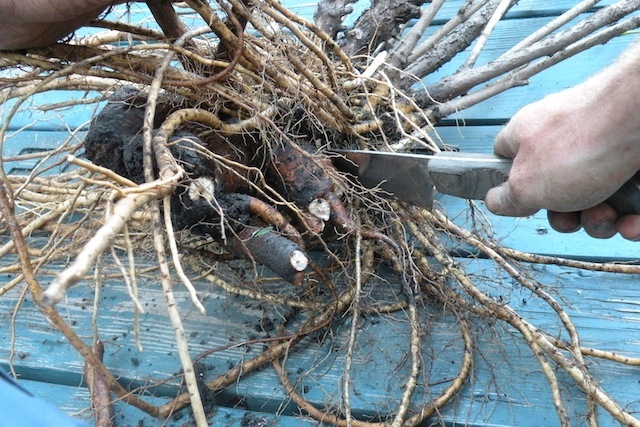 Trim ragged cuts and removed blackened bits of root. 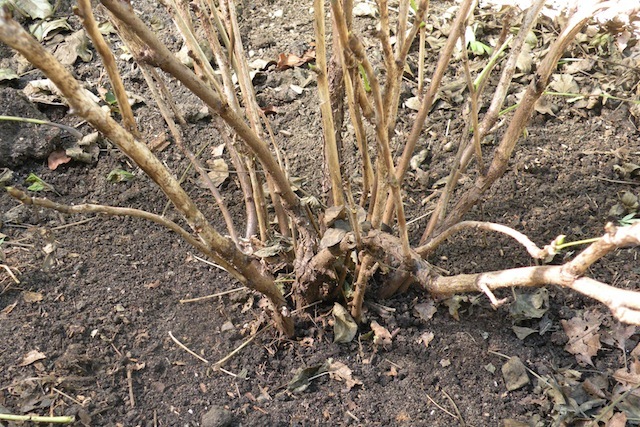 To ensure that the above ground buds will not put too great a strain on the roots, we recommend trimming the top growth back by as much as 1/3. 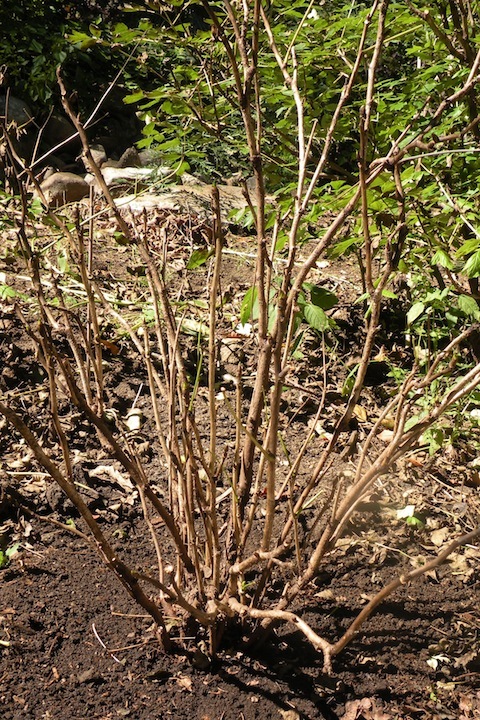 In the case of very small divisions with little root, totally remove the woody top growth in favor of new, more vigorous buds. 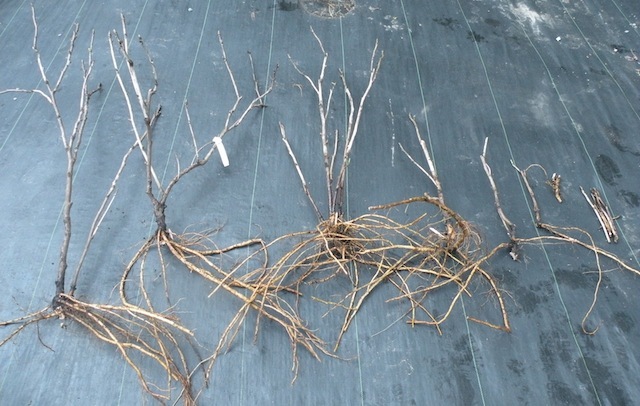 Three large plants, one medium, two small, one very small and lots of scions to graft. Replant new divisions immediately. 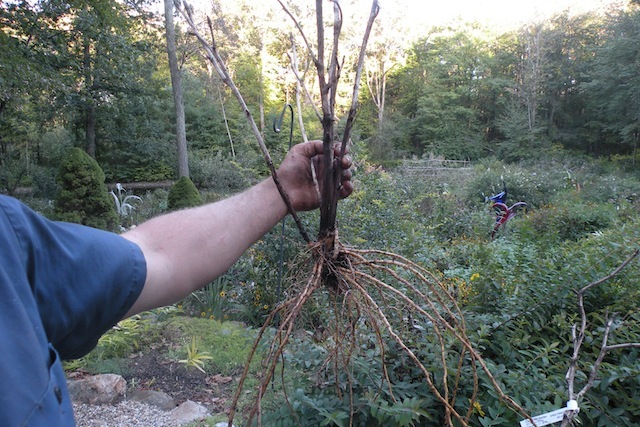 If the roots dry out, the plant will take longer to establish in its new location. 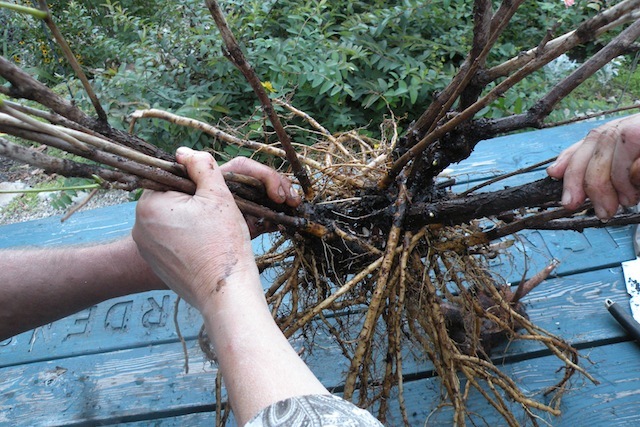 Dividing an older tree peony is not for the beginning gardener, nor the faint of heart. It is a given that the new divisions will take a few years of growth before the begin to flower well. In the end however, the result will be many more tree peonies to enjoy. Should you have any questions regarding this post, please do not hesitate to contact us.